This baby blanket was so easy it feels like I cheated! It’s not fancy at all, but here in Texas there is rarely a need for blankets, and especially for a baby born in June. A piece of flannel should be more than enough for a couple months. 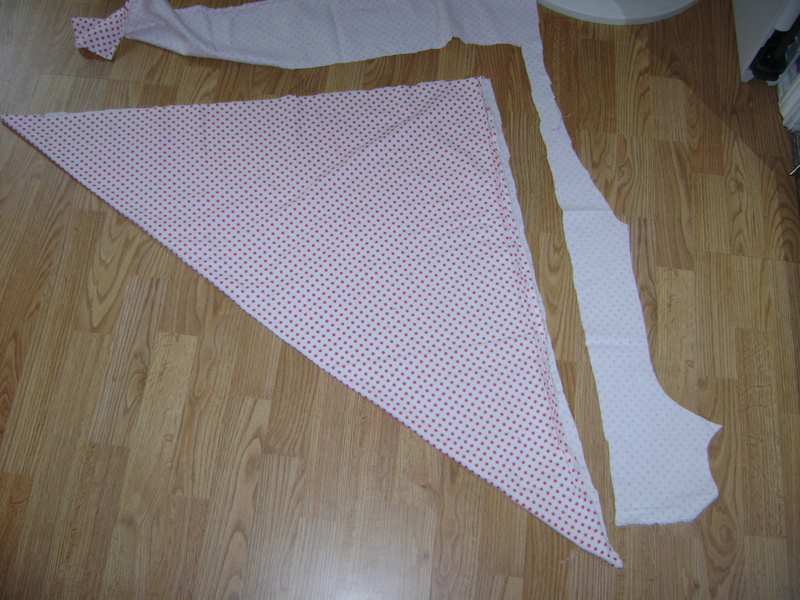 Out of my three fabrics I had the most of the polka dot flannel left. I used just about one yard to make the blanket. I took my piece of flannel and laid it out on the floor. I folded up one corner of the fabric to make a triangle. 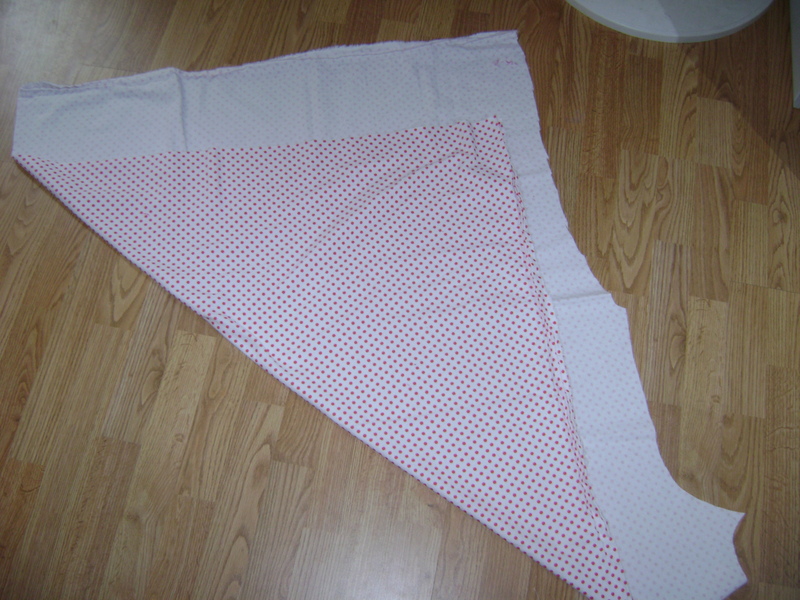 I cut around the edges of the triangle to even out the fabric. This left me with about a one yard square of flannel to make my blanket. Next I used a three thread overlock stitch on my serger around all four sides of the blanket.The knife helped even out the edges since my cutting was a bit jagged. I used a dot of Fray Check on the corner where I started and finished serging to help secure the threads. It was that easy! I could have embroidered this one, but I didn’t. 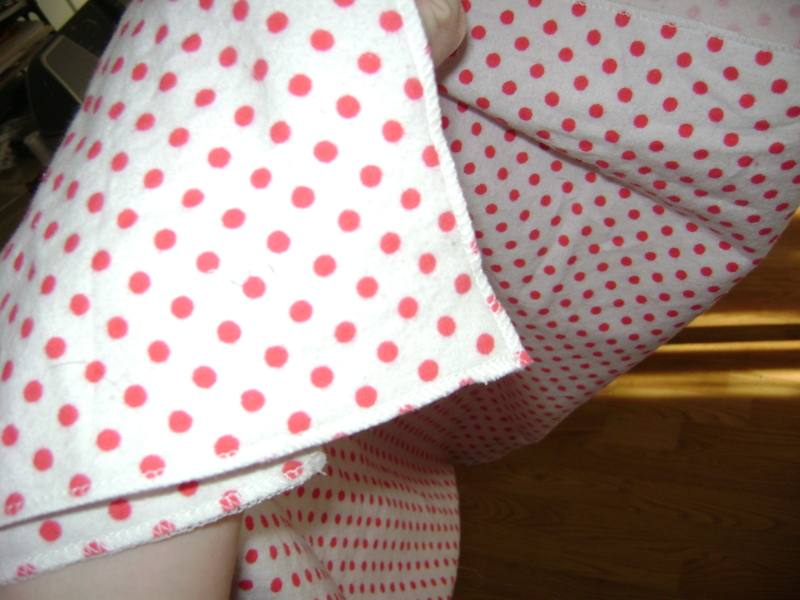 I like the polka dot fabric on its own. It is just a single sided piece of flannel with serged edges! 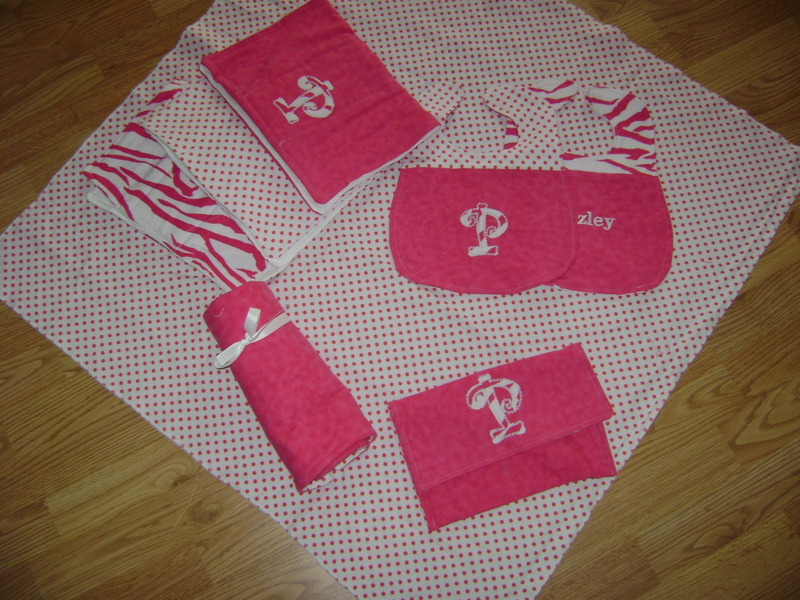 Just look how good that easy-peasy blanket looks with the other gifts we have put together! I love it! 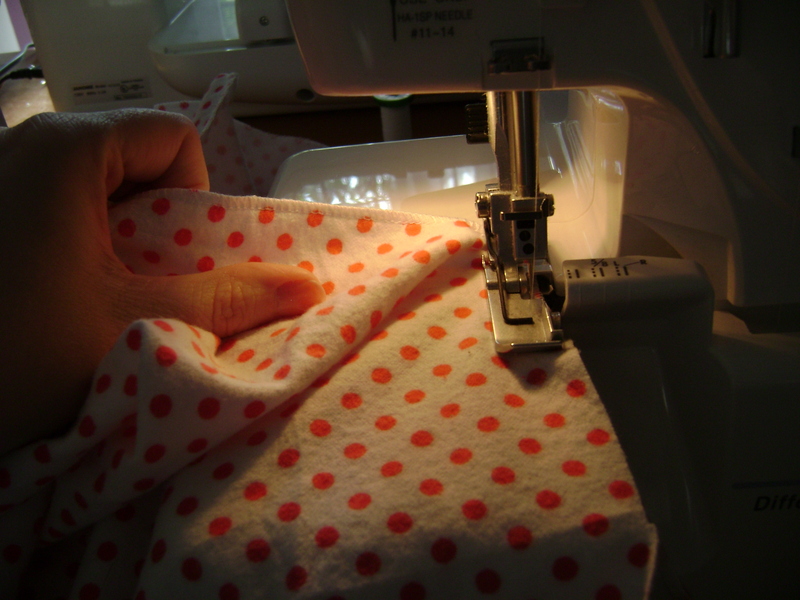 This entry was posted in Make for Baby, Project Tutorials, Serger FYI and tagged baby blanket, baby gifts, make for baby on April 12, 2012 by staciethinks. I love the baby set! So adorable. 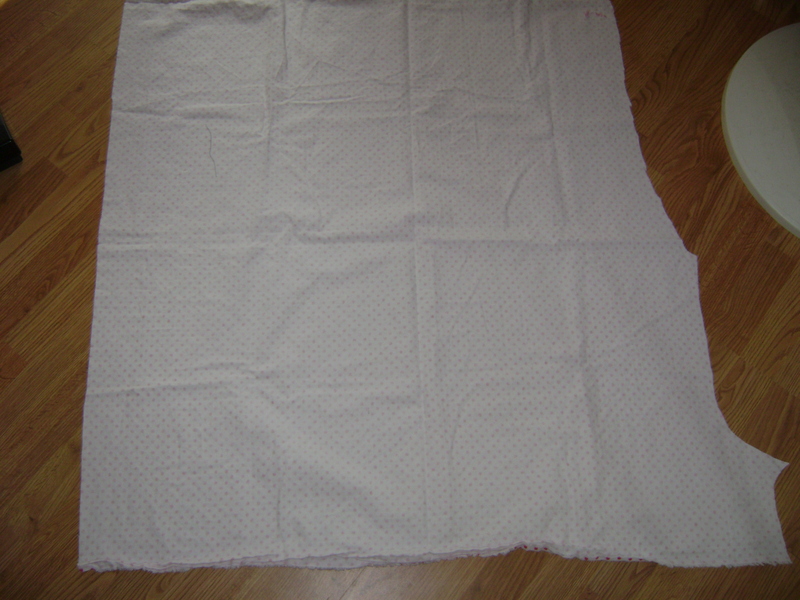 We live in California so light blankets for babies here are all we need too. I think I will go get some flannel! I’m so excited to hear it! I think you’ll love the blanket then! So darn easy!